Posted by Becky Engen on 9:00 AM on September 23, 2014 . Walk into the ReStore on any given day, and you may just have the pleasure of meeting ReStore Cashier, Tommy Besaw. Prior to working at the Twin Cities Habitat for Humanity ReStore, Tommy worked as a foreman at a local construction company. While performing demolition work one day, Tommy's arm was injured and he was unable to continue executing his daily construction tasks. 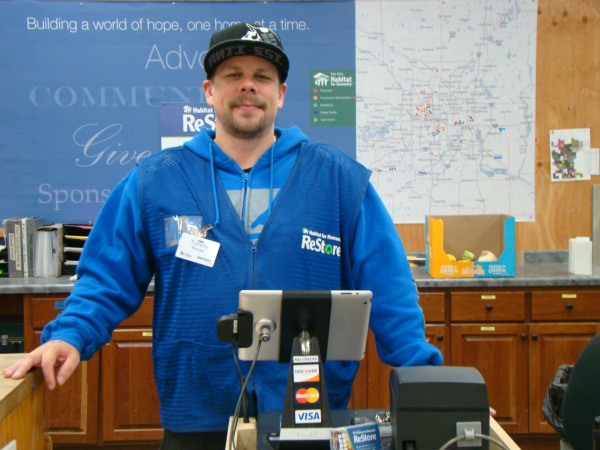 He was referred to the ReStore through a work transition program and became a ReStore Cashier six months ago. This customer service role is the perfect fit for Tommy, as it does not cause repetitive stress on his injured arm, and it pairs well with his outgoing personality. Tommy is at the ReStore roughly thirty hours each week as a cashier, and also helps with pricing inventory and providing additional customer service. "I look forward to coming here," said Tommy of the Restore. "We share a lot of laughs, and the staff and volunteers here make you feel like family." Tommy's knowledge of Twin Cities Habitat for Humanity was similar to many in the community - he knew of the homebuilding and homeownership program, but was surprised to learn of Habitat's wide range of projects and services. He has also seen first-hand the amount of work and dedication put in by Habitat homeowners as part of their required sweaty equity hours. "The homeowners are great to work with," said Tommy. "We laugh and joke, and the workday tends to go by real fast." Working hard and giving back is important to Tommy and his family. Each year, Tommy, his wife, and their six-year-old daughter pick a local organization to support. In previous years, they've donated toys to Toys For Tots around the holiday season, but this year, Tommy's daughter is going to donate some of her toys to stock the kids area at the ReStore. "She's even going help us put them out on the floor," Tommy added with a smile. 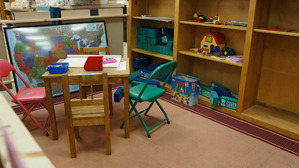 After his arm rehabilitation and therapy is complete, Tommy plans on continuing his work at the ReStore as a volunteer. "I have some really great memories with the people here," Tommy shared. "This year has been tough with my injury, but working here has been great, and a positive experience while going through a difficult process." If you're interested in becoming a ReStore Cashier (Tommy recommends this opportunity for people with friendly, patient and outgoing personalities), or if you wish to explore or sign up for other ReStore Volunteer Opportunities, visit our website. As an added bonus, volunteers get 20% off their ReStore purchases on the day they volunteer at the store! 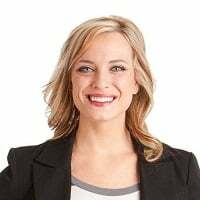 Becky Engen has a passion for writing and building and engaging with communities through social media. She graduated from St. Cloud State University, and began her career in marketing and advertising as a junior copywriter and social media specialist. Becky joined the Twin Cities Habitat marketing team in 2013 as the Digital Marketing Program Manager and loves that she continues to learn something new each and every day about the great people who work for, volunteer with, and are served through the organization.